For aesthetics purposes, i chose to keep the menu from my theme (twentyfifteen). I have a large catalog of products and i use Woocommerce to keep them into categories and products. Everytime I add a new product I also have to add the product manually into the wordpress menu. Now that the website is getting bigger, i'll have a lot of new products and i'll always have to keep that up to date. The Woocommerce widget "Woocommerce product category" adds automatically new products when they are set as child of a category. This is the menu i have. If i add a product in "storage cabinets" i will still have to go on the back-end and add it manually for it to show as a child of "storage cabinets". 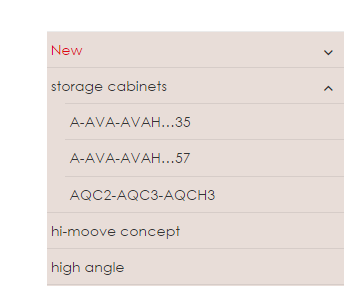 Is there a way to add automatically a product into his right category as when i create it i set the category "storage cabinets" ? Hope I could keep it clear and thank you for your replies. Don't hesitate to ask for clarifications as English is not my first language. EDIT: This code below was the original code. Don't use this!!! I'm leaving it here so because of the comments. //add a top level list for the category name.